Listening to jazz musicians improvise, how the piano player's chords toy with the sax player's runs and the standup bass player's beats, it may seem like their music-making process is simply magic. But research of jazz musicians' brain activity as they improvise is helping shed light on the neuroscience behind creativity, and it turns out creating that magic is not as serendipitous a process as we might think. 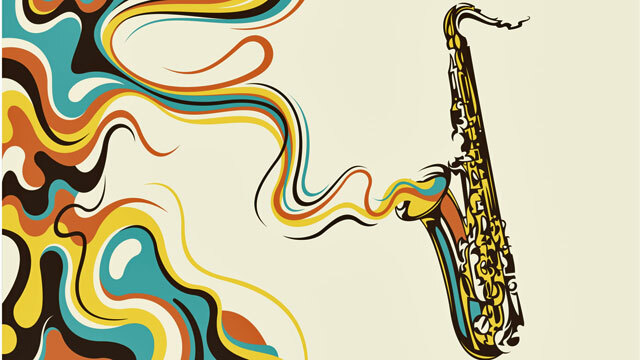 “I started looking at jazz musicians playing the blues as a way to understand how the creative brain emerges from a neuroscience perspective,” said Charles Limb, associate professor of Otolaryngology-Head and Neck Surgery at John’s Hopkins University. Limb, a jazz musician and music lover, and his team designed a plastic keyboard that jazz musicians could both play and hear while they were inside an MRI machine. Limb asked the musicians to play a memorized piece of music, then improvise with another musician in the control room. Limb captured images of their brains as they played. When musicians go to an improvisation, the brain switches, Limb said, and the lateral prefrontal lobes responsible for conscious self monitoring became less engaged. “Musicians were turning off the self-censoring in the brain so they could generate novel ideas without restrictions,” he said. Interestingly, the improvising brain activates many of the same brain centers as language, reinforcing the idea that the back and forth of improvisation between musicians is akin to its own language. The same principle applies to something like writer's block. “When you're trying so hard to come up with ideas you can’t do it, you can’t force it,” Limb said. “Then at another time, some flip switches and you've got this flow going on, this generation of ideas.” When the stakes are higher and the brain is actively over-thinking something, it can interfere with processes that have become routinized, causing behavior or performance to suffer. Luckily, creativity isn't an unknowable, mystical quality. It can be developed. “You have to cultivate these behaviors by introducing them to children and recognizing that the more you do it, the better you are at doing it,” Limb said. The problem is a lot of kids don’t get much unstructured time either in school or out of it. School is often based on right or wrong answers, leaving little room for students to come up with ideas that haven’t been taught to them before. “It doesn't have to be so directed all the time,” Limb said. “We've taken a lot of the joy out of things that used to be joyful.” Even a lot of music lessons have become about the discipline of learning to play well, not the joy of creating the music. Children should have part of every lesson reserved for improvisation and free form play, Limb said. The same could be said for free play on the playground and experimentation with new ideas in the classroom. Unprogrammed time is necessary for students to practice using their creativity. In recent years many schools have cut their art programs as non-essential subjects. At the same time, leaders are crying for more creative thinking in students. “We tend to look at education of creative aspects of children as something that happens incidentally and that is entertainment-based,” Limb said. But that misses the connection between creativity and the idea generation necessary for strong problem solving skills. “Art may be one of the best ways to train the brain to have this kind of creative fluency,” Limb said. He believes art is as central to education as math and reading, especially when created in collaborative environments like band or orchestra. Limb is working to set up an experiment testing his theory with kids who have never had drawing or music lessons before. He’d like to see what’s going on in their brains when first allowed to improvise. Capturing the brain as it begins to create could help deepen an understanding of how to support creative growth. Interestingly, the creating brain looks a lot like the dreaming brain, one of the most creative states humans can enter, but one associated with unconsciousness. Similar to what Limb observed in jazz musicians, when people dream the self-monitoring part of the brain is suppressed and the default network in the brain takes over. This is the introspective part of the brain, as well as the autobiographical part. That’s why dreams feel so personal, pulling from experiences or recent worries. “The brain is an organ and some of its functions are geared toward generation of unpredictable ideas,” Limb said. That’s just how it’s meant to function. Listen to a Science Friday interview with Charles Limb for even more about his interesting research.